pick up an application soon! 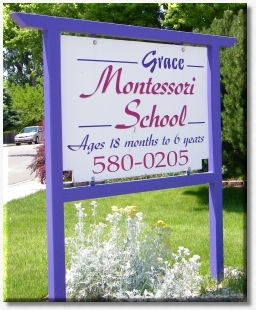 Grace Montessori School opened its doors in August of 2004. It was a dream of more than 25 years and incorporated the help of many friends and family. Grace Montessori early learning facilities are constructed with children in mind. Child size furnishings, and equipment are part of the learning environment. Playgrounds are safe and well equipped for large motor development. Grace Montessori School is in the process of making changes to ensure the safety of the children in any emergency situation. Each of our classrooms within Grace Montessori School, Basic Trust, Combo A and Combo B, has a Montessori trained and qualified teacher in the classroom. We, at Grace Montessori, take very seriously our responsibility to guide your child through a world of discovery on the path to constructing a secure, balanced personality with an active, competent mind. The happy balance of freedom to explore and work within a prepared, orderly environment, filled with specially designed mind-engaging sensorial materials and activities, is the hallmark of the Montessori learning environment. The art of the Directress is to respect the freedom of each child to forge his own unique path of learning and growth energized by his natural curiosity; but vigilant to inspire and encourage each child to take in hand a rich enough wealth of activities and experiences to ensure successful development. At Grace Montessori, our Directresses are dedicated to guiding your child in the right direction. Parents who select Grace Montessori School have greater peace of mind and confidence when they leave their children in those early years. Grace Montessori is different because of the ongoing support the parents, children and teaching staff receive. Grace Montessori early learning facilities are constructed with children in mind. Child size furnishings and equipment are part of the learning environment. Playground are safe and well equipped for large motor development. Our staff help children feel good about themselves, their activities and other children. Our staff are gentle, consistent and flexible to the needs of each child. The child/staff ratios provide enough staff to foster each child's educational, physical , personal and social development while nurturing all children in a well planned program. Ratios meet the guidelines set by the National Association For The Education Of Young Children (NAEYC). The learning environment encourages growth and development of each child. Activities are planned inside and outside with child initiated activities. Our staff is adequately trained in first aid as well as CPR. Each staff member has gone through FBI checks to provide for the safety of all of the children. Emergencies are minimized through emergency procedures, fire drills, smoke detectors and doors which lead directly outside. At Grace Montessori School, we realize that the quality of early childhood programs have the ability to greatly enhance the early, formative years. Each experience your child has throughout these crucial years will last a lifetime. At Grace, we realize a quality early childhood program can greatly enhance the early, formative years. Experiences during these crucial years will last a lifetime. We take our responsibility seriously to guide your child through a world of discovery on the path to constructing a secure, balanced personality with an active, competent mind. The happy balance of freedom to explore and work within a prepared, orderly environment, filled with specially designed mind engaging sensorial materials and activities, is the hallmark of the Montessori learning environment. The art of the directress is to respect the freedom of each child to forge his own unique path of learning and growth energized by his natural curiosity; but vigilant to inspire and encourage each child to take in hand a rich enough wealth of activities and experiences to ensure successful development. At Grace Montessori, our Directress and teachers are dedicated to guiding your child in the right direction. Parents who select Grace Montessori School have greater peace of mind and confidence when they leave their children in those early years. Grace is different because of the ongoing support the parents, children and teaching staff receive. Grace Montessori is looking to further our teachers education by hiring teachers that want to further their Montessori education by getting their Montessori degree. This will enable each class to have two teachers with Montessori degrees and be able to further the child's education with a better knowledge of the Montessori method of learning. The early childhood teaching is a different teaching method than the Montessori method of teaching. We will also encourage our teachers to further their education with college classes. We are a traditional Montessori school and want to continue to teach this to our children. Grace Montessori is committed to giving the community, parents and children the best opportunity for a traditional Montessori education. We are located 39 miles southeast of Boise, Idaho and 15 minutes away from Mountain Home Air Force Base. Our hours of operation are 6:am to 6:pm with extended day options for working parents. This forms will open up in a "Word" document and you can print it from there. This for is ONLY for enrollment and will not have any other forms needed. this form in order for your child to receive medication at school. THANK YOU! Please THOROUGHLY read the handbook BEFORE signing the form. any questions, comments, suggestions or concerns. When you have finished reading the handbook, please print out the Parent/Student handbook agreement form available at the end of this page, read and sign it and return it with your child's registration package. Signing the form indicates that you have read and fully understand the handbook and are prepared to work with the school on the guidelines we have put in place for our school. Please call us for an appointment or stop by to discuss tuition fees or for other questions and comments. 8 - Parent Night 6:00p.m. - 7:00p.m. are welcome to join us at 11:30 a.m.
26 - School resumes - welcome back! the school after the hayride. 1-4 - NO SCHOOL - HAPPY NEW YEAR! 7 - School Resumes - Welcome Back! 1 - School resumes - Welcome back! 24 - Art/book show - 6:30-7:30 p.m.
3 - Cinco de Mayo - 11:30a.m. 17 - Graduation Day - 1:30 p.m.
3 - Summer School Begins at 9:00 a.m.